On behalf of the IFP National Executive Committee, in my capacity as National Spokesperson for the party, it gives me great pleasure to cordially invite you to our very first Media Café in Durban, KwaZulu-Natal. As we head into the 2019 National and Provincial Election, with only a few months left, the IFP wishes to engage with all Editors, Political Reporters and journalists to inform members of the media of our new spokespeople, relevant media and communications officials and our message for the 2019 National and Provincial Election. 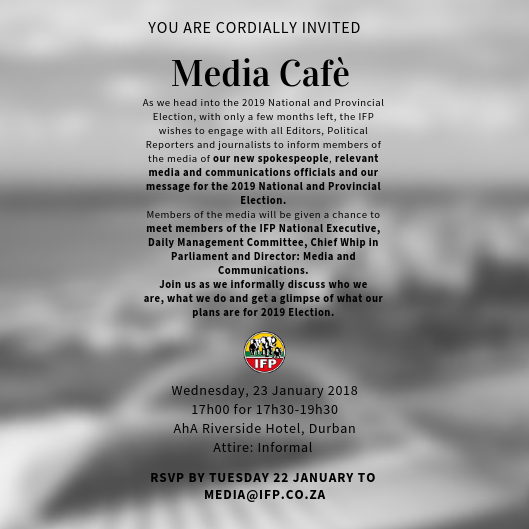 Members of the media will be given a chance to meet members of the IFP National Executive, Daily Management Committee, Chief Whip in Parliament and Director: Media and Communications. Join us as we informally discuss who we are, what we do and get a glimpse of what our plans are for 2019 Election. RSVP to [email protected] by Tuesday, 22 January 2018.